Social Media Identity Crisis: How do employees and brands avoid a personality disorder? A mindmap of our discussion created in real time at WPP Stream; click it for the whole shebang. 1.Firms are increasingly calling upon their employees to “be” the brand. That is, represent their employer’s brand in new and increasingly personal ways through social digital expressions of themselves. 2. Meanwhile, there is a “social media miracle” mentality out there that needs to be debunked. Most people don’t want to be “brand ambassadors” for their firms — it’s simply a fallacy that you can somehow easily convert them just by asking nicely. And when you engineer programs based on the social media miracle mentality it will inevitably flop due to a lack of authenticity, participation or both. So the name of the game is this — can you (as a manager of a brand or someone interested in switching on the social-ness of your business) shape the culture, policies and platforms etc within your firm without alienating individuals? Afterall, social media or social business inherently demands the participation of some people (um, “social” right?) so you would think your employees have to be there, no? Of course rewards and recognition for participation also came up — most organizations do not expressly reward or recognize brand-building for individual employees in a meaningful way. Even those in the session who said their firms had built social media participation into some of their employees’ goals said that it was basically an empty gesture or a very peripheral activity. Anyway, many of the ideas are captured in the mind-map that you can see attached here. Have a look and let me know what you think. Thanks, Goldie! Long time no see 😦 Hope you’re doing well and glad to hear you will share with your folks at Adobe — there was participation form Adobe at the Stream conference (you were sponsors, in fact) though I can’t at the moment recall who attended. Interesting Ethan! Have been discussing Social Media in the Arts (ie, Gallery and Museum staff & marketing strategies) at Uni, so v. topical here. 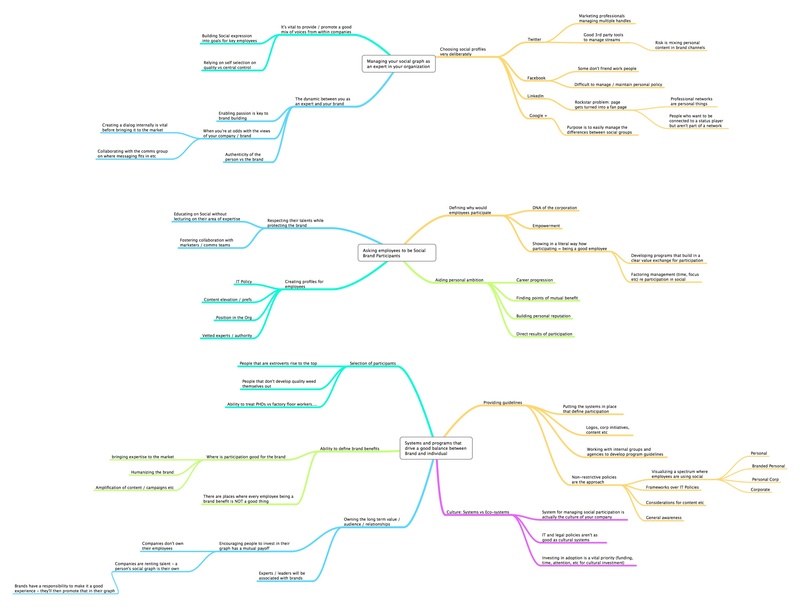 Gotta love mind maps too…yours looks like MindNode Pro?, which I’m using at the moment. Will definitely share. Interesting and timely commentary that had just come up in an office discussion last week….we didn’t make a decision either way quite yet.